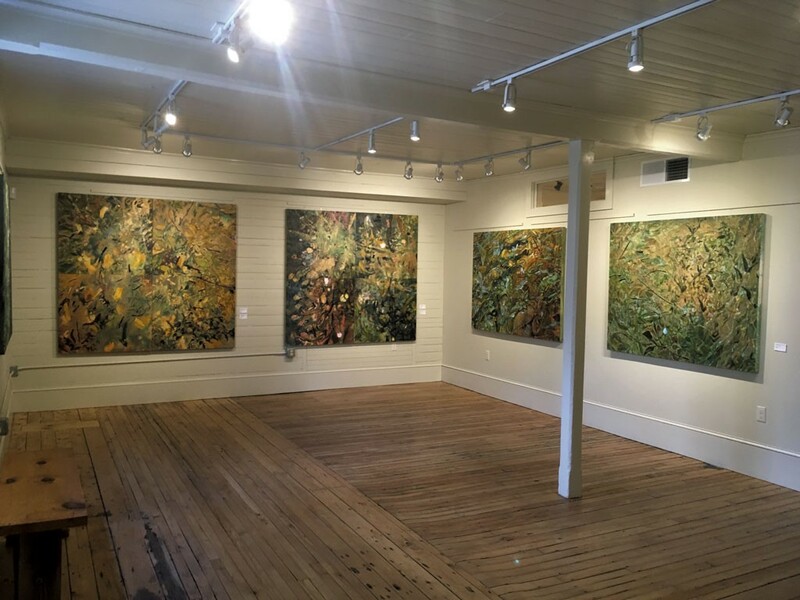 "Shelburne Orchards I & II"
Viewing the latest exhibit of Cameron Davis' paintings is like stepping into an old-growth forest. Senses become alert to nuances of light, depth and color. The mind is calmed by an invitation to linger and look closely at what is visible and what is hidden beneath layers of time and space. Davis' exhibition at the Northern Daughters Annex Gallery in Shelburne is a rich and complex foray into art, nature and community. It is both an opportunity to "celebrate these amazingly dynamic young gallerists, Justine Jackson and Sophie Pickens," Davis says in an interview, and to honor "this community hub, which Kevin Clayton has created." The Annex — to Vergennes-based Northern Daughters gallery — opened last fall in a light-filled room in the newly expanded Village Wine & Coffee, which Clayton owns. "I was really interested in the intersection between people and place," Davis says, "so I chose paintings that were informed by the surrounding landscape, within a mile of Shelburne: the La Platte River, Shelburne Orchards and Lake Champlain." Twelve acrylic works on panels or canvas present abstract and representative images. 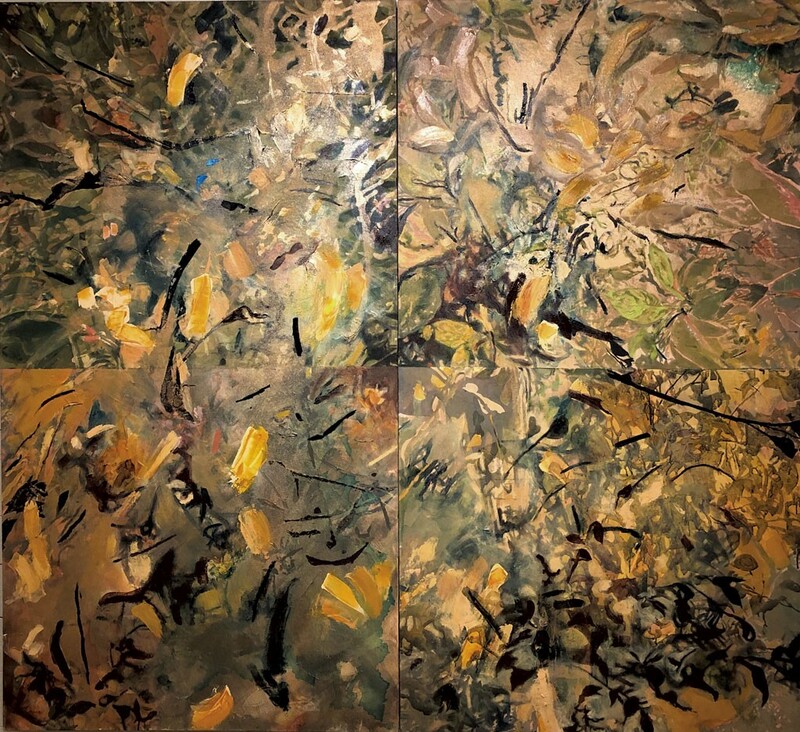 In "Shelburne Orchards I & II," dark branches poke out from an explosion of greens and yellows, inspired by the orchard's fall hues, Davis explains. The two 66-by-36-inch canvases are displayed side by side, touching each other, and each has a visible line across its center. From a distance, four small, square paintings compose one large square, but colors and gestures bleed across the boundaries. "I'm interested in the simultaneity of moments," Davis adds. Rather than create paintings of single locations, she has combined multiple frames within the same canvas to convey "multiple times in multiple places. For me, that makes it more dynamic and changing, the way it feels like life really is." A lifetime of experience grounds Davis' art. Since the 1970s, the senior lecturer in the University of Vermont's Department of Art and Art History has been painting and showing her work locally and regionally. The recipient of numerous awards, she most recently won the 2015 UVM Lattie F. Coor Collaborative Fellowship for her project "UVM and the Environmental Humanities." In the past year, Davis has exhibited in Princeton, N.J., and Cleveland, Ohio; locally, her art is currently on display at the UVM Medical Center as well as in Shelburne. Davis also serves on the steering committee of the UVM EcoCulture Lab, a collaborative effort among artists, humanists, scientists, designers and others to address the ecological challenges of the Anthropocene era. Her reverence for the Earth and concern about climate change and social justice profoundly shape her art. Davis created "Champlain Tonglen I (white)" and "Champlain Tonglen II," on view in Shelburne, with the health of Lake Champlain and the entire Champlain Basin in mind. 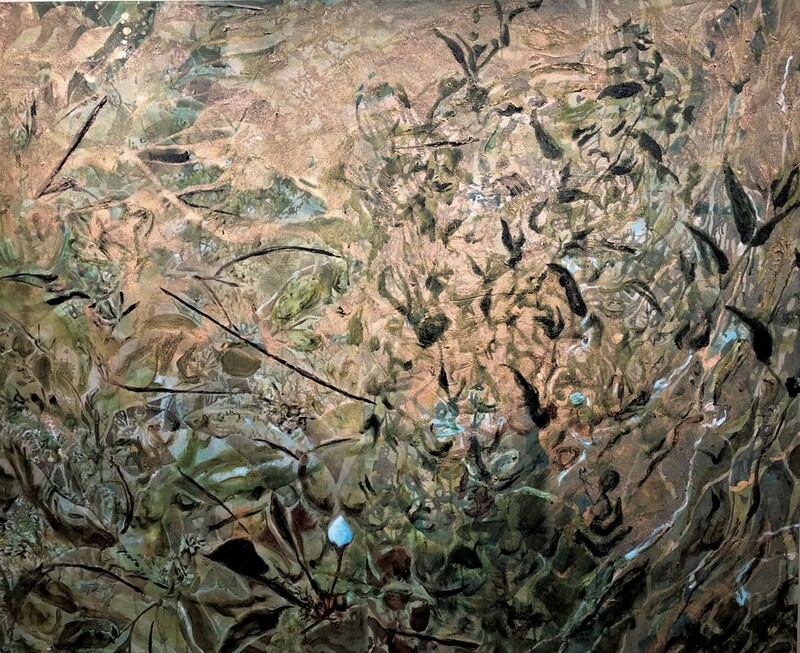 Based on the Tibetan Buddhist practice of tonglen — "the breathing in of suffering and the breathing out of healing," Davis explains — both 48-by-60-inch works reference grief over water degradation and offer beauty as a form of healing. Like woodland ecosystems, some paintings present different information according to one's vantage point. Peering at "Airs, Waters, Soils (Places) IV" up close from the left reveals dark twigs hovering above an amorphous, verdant backdrop. Facing it from two feet away highlights gold-colored paint that evokes the precious or sacred but also reflects light, obscuring images beneath. From across the room, the work churns in an apparent cycle of death and rebirth. "The compositional complexity in her paintings is balanced by a rich but limited palette that allows the viewer to soak in their potency and not be overwhelmed," writes Jackson in a press release. "Her use of translucence in her representation of plant matter allows you to see the decomposing forest floor and plants in full bloom at the same time." Davis' paintings seem to continue evolving even after she has hung them on the wall. Most works in the exhibit have experienced rebirths of a sort. The tonglen, orchard and other series on display were also shown at the 2016 exhibit "Of Land and Local: Watershed," organized by Burlington City Arts and Shelburne Farms. But Davis has since "reworked, rethought and rearranged them," she says. For example, the tonglen pieces originally "were much leaner. I took the layering further and shifted the emphasis of what you notice and don't notice." How does she know when one of her works is complete? "It draws you in," Davis suggests. "You keep wondering; you keep thinking about it. There's a presence about it. It's alive." 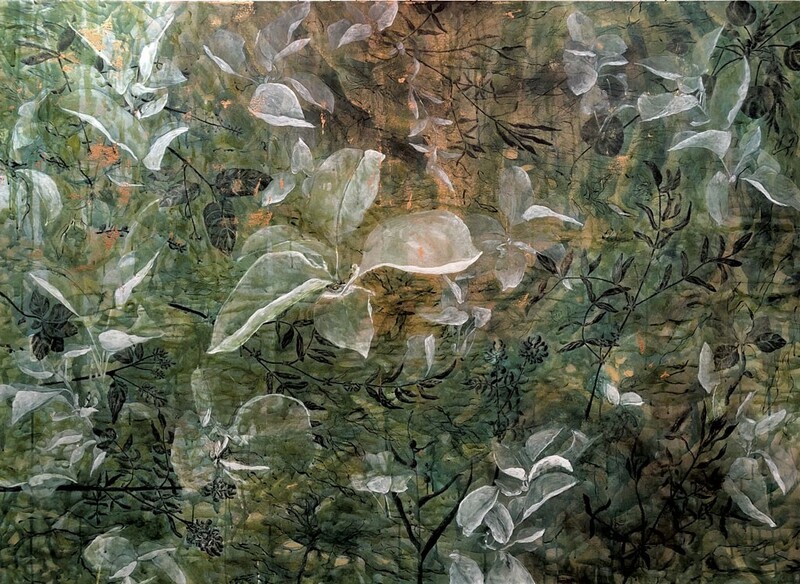 "Airs, Waters, Soils (Places) IV"
Davis is currently working on a new series "deciphering the lyrics of lichen," she says, referencing the words of author Ursula K. Le Guin. Central to the series is the concept of sympoiesis, or "the making with," as Davis defines it. While painting a lily pad from the La Platte River, for example, she considers its life and health and responds to patterns she observes in the plant and surrounding water. 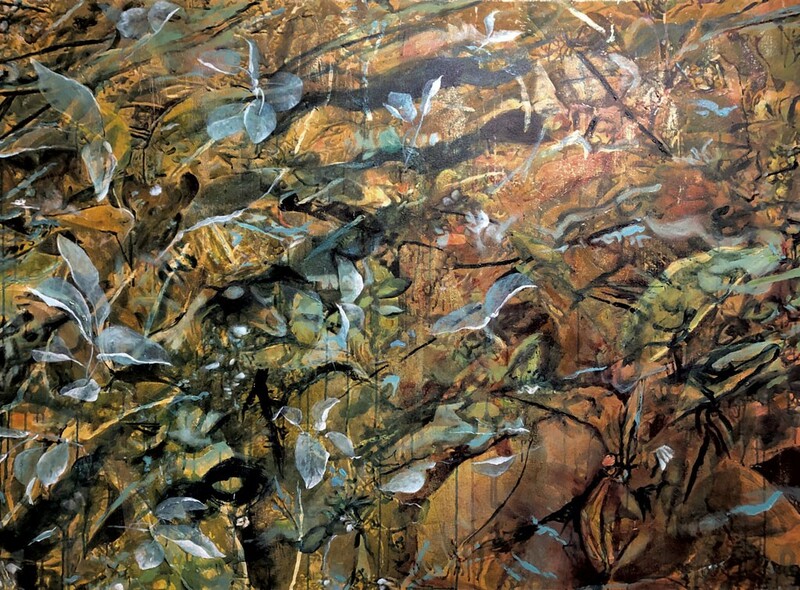 Through painting, she engages with the complexity and interdependence of nature in an improvisational, emergent way. In describing this process, Davis cites filmmaker Nora Bateson, director-producer of the documentary An Ecology of Mind, who asks, "How can we improve our perception of the complexity we live within, so we may improve our interaction with the world?" Like Bateson, Davis believes that "the arts are where we flex the muscle of relational understanding — how things are in relationship to each other. It's the way all of evolution works." As Davis ponders tools to help humans address climate change, she looks to our evolving understanding of the interdependence of ecological systems. "I think we're entering into understanding wholeness," Davis says, "whether we're talking about soil or talking about tango or talking about the space in a painting." The original print version of this article was headlined "Understanding Wholeness | Cameron Davis, Northern Daughters Annex Gallery"